I remember seeing this sort of thing a lot as a boy growing up in Holland. Rarely do I see such displays here. Is it because grills are smaller than they used to be? In the Easy and Elegant Life’s alternate universe, Christmas wreaths would bedeck most front doors and most certainly hang from most hood ornaments, religious affiliations permitting. 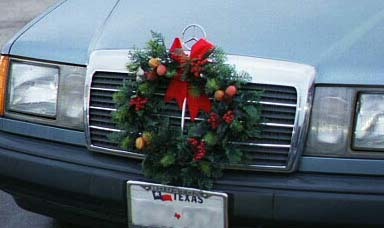 Do, or can, you decorate your vehicle for the holidays? This entry was posted in Elegantology, Uncategorized and tagged Christmas cars. Bookmark the permalink. Oooo I put one on our Explorer every year – thanks for reminding me to get a new one! I see that quite often here in Southern California. I’m surprised I haven’t seen on already for this year. I have not done this for awhile and I have a wreath that would work fine! I totally forgot about this. Thanks for the idea! I think it’s illegal in western australia (where I used to live) so the thought hadn’t ever crossed my mind. in the northern hemisphere there shouldn’t be any reason not to as the air is cooler and blocking the radiator a small amount wouldn’t put your car in danger of overheating. I’m not too keen on the decorated car…at least not for my car. Skip, welcome. They look great. I just bought one for Mrs. E.’s station wagon. We put one on the SUV, but not on the cars. Might not be as popular now since most cars don’t have hood ornaments. festooned through the roof rack. Unfortunately, in our climate and when the snow is really piling up, our streets get so disgustingly murky that a pretty little evergreen wreath would end up with a crusty coating of a sand, gravel, and snow on it and barely be visible. Love the idea as long as the wreath is not an artificial one. Paula, an interesting point. I hadn’t thought about artificial vs. real wreathes.